The Carrier Infinity series has a Two-stage operating system which gives you the power in the higher stage to heat your home even in the harshest winter and the more economical lower stage which keeps your home at the temperature that is most comfortable to you. 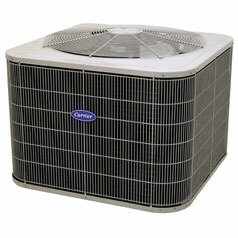 Up to 19 SEER which indicates that during the summer days your home can be cooled efficiently and cost effectively. Up to 9.5 HSPF which indicate that the heating of your home is done with efficiency. The higher the HSPF count the more efficient the unit. 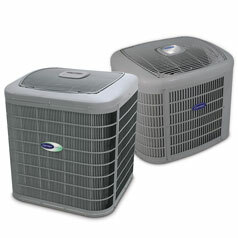 Superior humidity and temperature control which will keep your home comfortable the whole year round. As low as 69 dB which is just below the noise level in a restaurant which a much quieter than many other units. 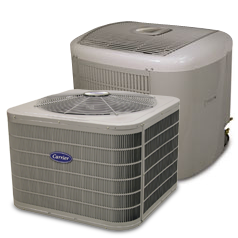 2-stage operation for enhanced comfort because the high stage heating or cooling brings your home to the temperature that you set the thermostat to and the low stage heating or cooling keeps your home at that temperature without spending a fortune on cooling and heating costs. Infinity Control gives you the control of your Heat Pump to set the environment in your home the way you want it to. A remote system is also available for maximum convenience. Silencer System II for quiet operation because the last thing you need during a cold winter is a Heat Pump that drowns out any other sounds. WeatherArmor System for ultimate protection to that your system lasts as long as you need it to. The clever design gives you longer use and durability. Enhanced diagnostics with Infinity Control so that when something goes wrong, you don’t need to go through countless lists to figure out where the problem came in. 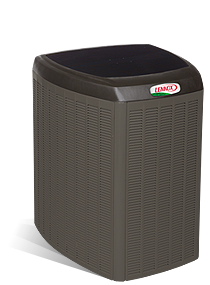 Environmentally-sound Puron refrigerant which protects the ozone layer and means that you do not need to replace your unit when the Federal law is imposed on cleaner air from Heat Pumps and Air Conditioners. 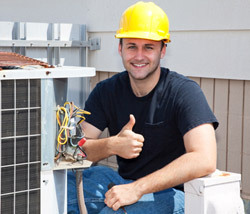 10-year parts limited warranty when properly registered which gives you confidence that your unit will endure the weather without failing on you. 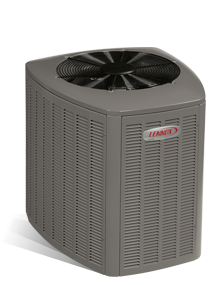 Up to 19 SEER and up to 9.5 HSPF which means that you will pay less in fuel because of the efficiency of the heating and cooling of this unit. 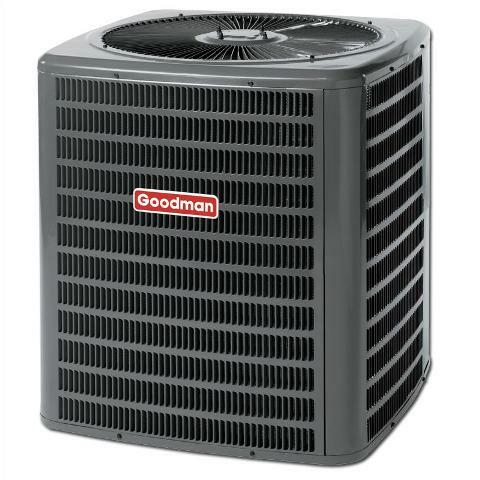 Optimal efficiency can be obtained by installing and maintaining the unit properly and by choosing the correct size unit for the size of your home. The Carrier silencer system II gives amazing sound reduction which meets or exceeds industry standards. The noise levels are reduced by the quiet motor mounts, sound blanket on the compressor, forward swept fan blades, a laminated sound elimination compressor mounting plate an and integrated silencer airflow baffle. Infinity control, Edge and Comfort 2-stage thermostats come with advanced diagnostic features puts you in charge of what is happening with your unit and gives you the piece of mind that you know what is going wrong when something is wrong. The controls have ease of use and convenience in mind first and foremost. The diagnostic intelligence is enhanced by the Infinity control. Refrigerant that is environmentally-friendly to the ozone and complies with international standards. Two-Stage compressor that functions in a circular motion for better efficinecy to give comfort right through the year. 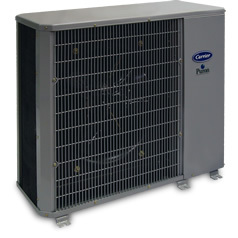 This unit offers a heating capacity of 24,000 – 60,000 Btuh, and a cooling capacity of 2 – 5 tons. This unit is constructed of heavy-gauge galvanized steel with a baked on powder coating for protection and durability. Coil guard made from steel to guard against the elements for the outdoor unit which adds to the durability of the internal parts. Outdoor units are also protected by WeatherArmor to protect against harsh weather conditions. Should the unit not be registered within the 90 days waiting period, the warranty to the original owner will be 5 years and not 10.